Is Brontosaurus Real After All? Post by guest author Josh B. Like many of you, I grew up learning that Brontosaurus was a real dinosaur. It was in all the books and media and one could even acquire toys of this plant eating behemoth. Then one day in my early teens, I read a book entitled The Great Dinosaur Mystery and the Bible. In this book, by Paul S. Taylor, it talks about how Brontosaurus was completely made up because a paleontologist, named Othniel Marsh, found a skeleton of a sauropod (long-necked dinosaur) missing a head and then found a sauropod skull several miles away that did not have a skeleton. In the late 1800s, when Marsh was digging up dinosaur fossils, there was a lot of pressure to name as many different dinosaurs as possible before the competition did. In a hurry so as not to be outdone, Marsh put the skull and skeleton together, and behold, a new dinosaur species. This book shook my world. Brontosaurus wasn’t real? This book also got me to think about dinosaurs differently in general. Although it is a children’s book, I highly recommend it. It’s a great read and it can even be found in our gift shop from time to time. However, while this trick was true, it turns out that Brontosaurus was real after all. Scientists have discovered, by performing an in-depth study of several fossils, that there are enough differences in a number of them to name one of them Brontosaurus. So while the original Brontosaurus was false, another recently identified sauropod may take on the Brontosaurus name instead. For all of us that loved Brontosaurus, we may no longer have to mourn the loss of this amazing creature that God created on day six of creation week. “Behold now behemoth, which I made with thee; he eateth grass as an ox. Lo now, his strength is in his loins, and his force is in the navel of his belly. He moveth his tail like a cedar: the sinews of his stones are wrapped together. His bones are as strong pieces of brass; his bones are like bars of iron. He is the chief of the ways of God: he that made him can make his sword to approach unto him. Surely the mountains bring him forth food, where all the beasts of the field play. He lieth under the shady trees, in the covert of the reed, and fens. The shady trees cover him with their shadow; the willows of the brook compass him about. Behold, he drinketh up a river, and hasteth not: he trusteth that he can draw up Jordan into his mouth. He taketh it with his eyes: his nose pierceth through snares.” Job 40:15-24. Was God speaking of Brontosaurus in this passage? None can say for sure, but we do know this was a sauropod of some kind. I have been doing some planting in Truassic Park, trying to coax wild things to grow where they can be enjoyed by visitors. We have plenty of invasive species, like Japanese Knotweed (that takes 10 years to eradicate), but native species are present as well. So what native plantings are here? Beautiful Scarlet Monarda – A member of the mint family, Monarda is incredibly fragrant, attractive to hummingbirds and great for herb tea. Mint – I transplanted a mint from private property in southern Ohio. This mint has an incredibly strong menthol fragrance. It is the first time I have gotten it to “take”. On the original property it grew in sporadic clumps. Joe Pye Weed – otherwise known as Eutrochium . To quote wiki – “Joe Pye (Jopi in the Native tongue), an Indian healer from New England, used E. purpureum to treat a variety of ailments, which led to the name Joe-Pye weed for these plants. Folklore says that Joe Pye used this plant to cure fevers. 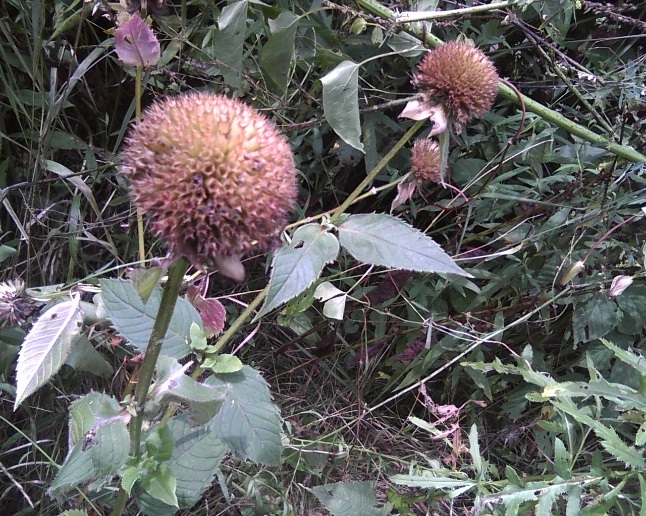 Folklore also states that American colonists used this plant to treat typhus outbreaks. 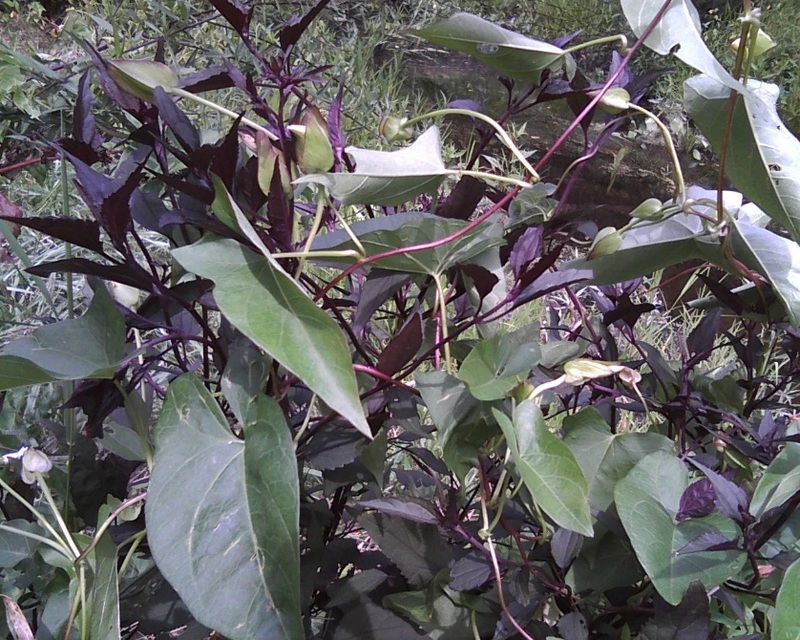 The author Hemmerly writes that the Indians used Joe Pye Weed in the treatment of kidney stones and other urinary tract ailments.” I planted a modern variant – a chocolate Joe Pye Weed. 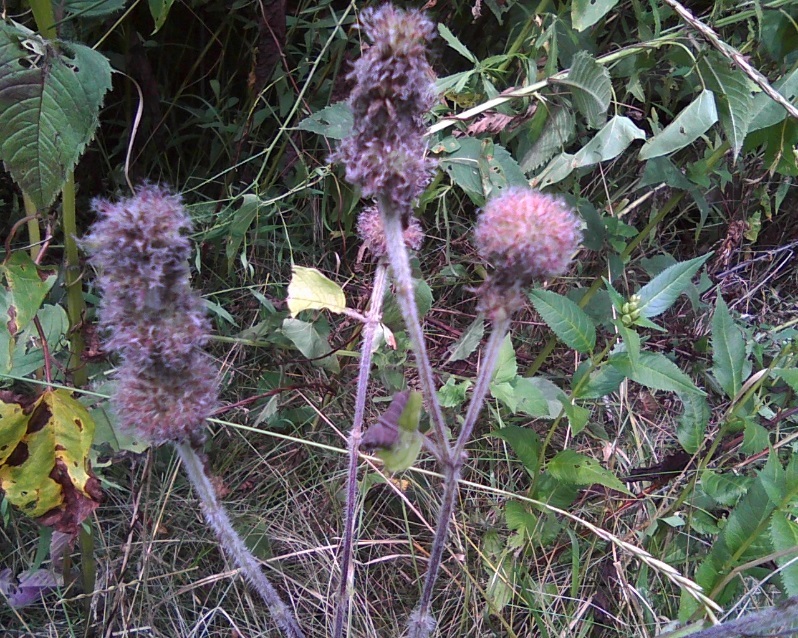 It is a plant that grows quite tall and loves to be near water. You can find it on the shore of our Viers Ditch Creek. 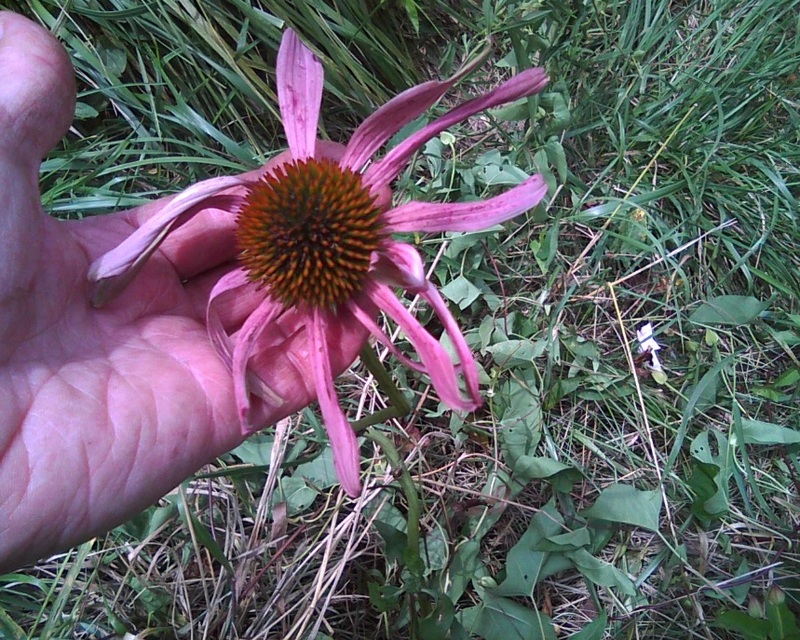 Eastern Purple Coneflower – another medicinal plant used by both Native Americans and early settlers. You may know it better as Echinacea. Jack in the Pulpit – bloomed in the early spring. I was so happy to know it survived being transplanted on the property from a commercial source. 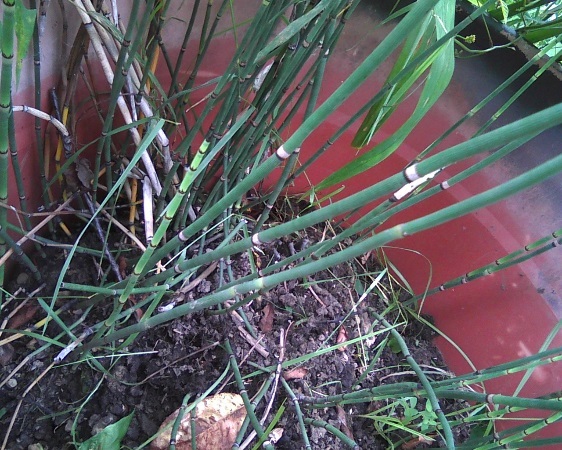 Equisetum – Known as Calamites in the fossil record, and as horsetails as a common name, this plant used to grow to incredibly heights of 100 ft. It currently only grown to be a few feet tall. Planted in pots to keep it from overtaking the park, it is surviving quite well. 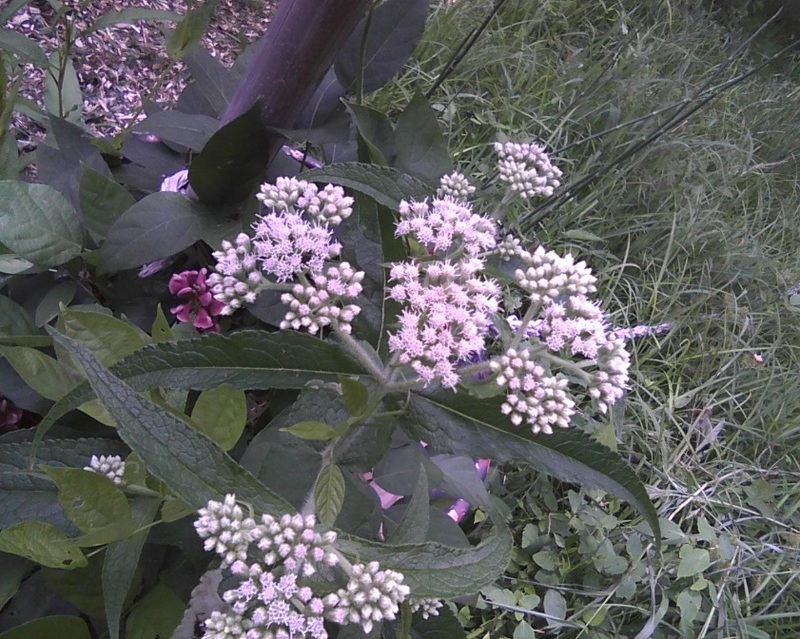 Boneset – not a plant that I transplanted, but one I have hovered over to help it survive. Although not currently advised as an herbal remedy, historically it was used to reduce fevers. Paw Paw – Hopefully, this new addition to the park will thrive for many years to come. The Paw Paw is our native Ohio fruit. The large, yellow fruits were a favorite of George Washington and taste like a banana/mango/cantelope? 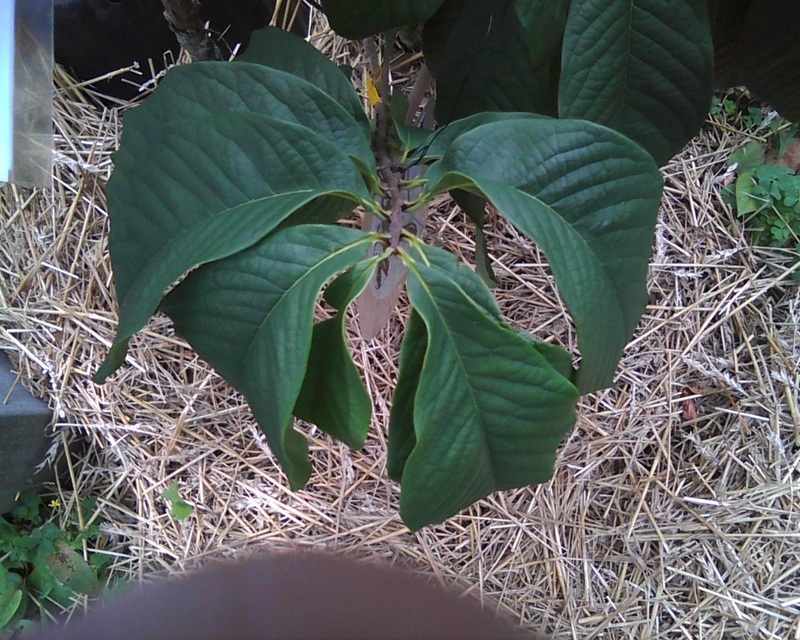 We will need to obtain another variant of our Shenandoah Paw Paw in order to set fruit. The Paw Paw is also the exclusive food of the Zebra Swallowtail Butterfly. In evolutionary circles, this is described as a “co-evolution” situation where two different organisms had to both somehow, through random chance changes, morph to exist as they do today with the butterfly totally dependent on this plant to exist. In creation circles, this is a wonderful example of a symbiotic relationship where one organism is provided with a specific plant as its food source. Paw Paw is also a “living fossil”. Surprise – I found some bright orange horns sticking out of the ground in our native flower area and included a photo for you. 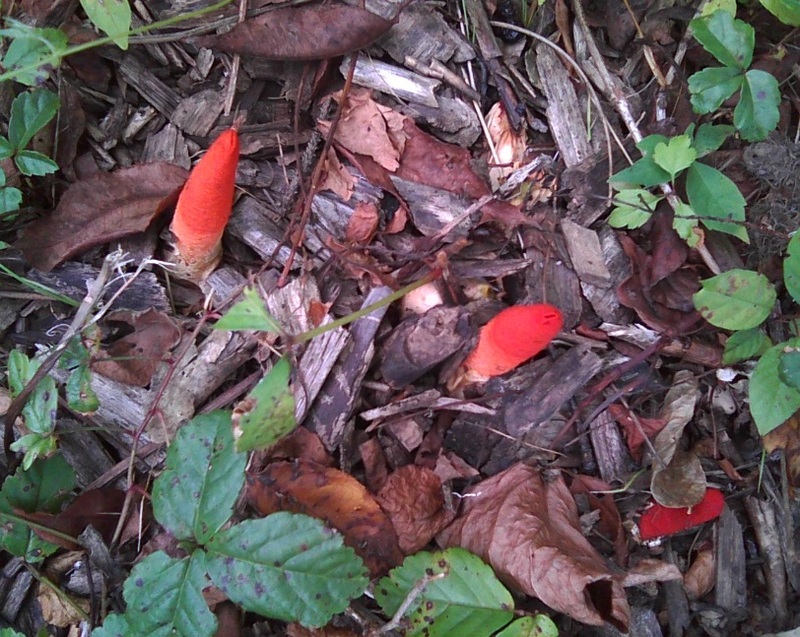 I learned that they are the fruiting body of a fungus group known as the dog stinkhorns. I have been conducting an experiment here at the museum by growing sweet potatoes on the roof. The original goal was to test the feasibility of cooling off the roof with sweet potato vines while growing some extra food. This is not a unique idea. There have been studies done in Japan and there have also been plenty of folks in the U.S. working at growing veggies on the roofs of homes and businesses. The plants have survived, but not thrived to the point of cooling off the roof. The positive aspect of this is that the plants needed less care than I expected. The negative is that I do not have a roof covered in vines. It is too early to tell if we will get sweet potatoes. I am sharing this so that if you dream of planting on your roof, you have some good “negative” info to help you make a good decision. A more detailed summary will follow at a later date. Thanks to the help of volunteer Kevin Stoner, we have a much more accessible Research Library where staff and visitors can read the latest journal articles as well as thumb through some vintage creation literature. The library is also equipped for viewing dvds. Although we are not equipped to loan out materials to anyone other than staff at this time, please feel free during your visit to ask about enjoying the library and see what you have been missing. The Akron Fossils & Science Center was designed as a resource for those curious about origins and those looking for a fun place to take the family or a group of students. The Science Center is aligned with the Academic Standards of the State of Ohio in all of its educational outreach, programs, and tours. No mention of the Bible, God, or creation is mentioned in the first two thirds of the tour. These first two sections are where the guests explore the fossilization process, apply probability and mathematics to protein synthesis, discover the immense complexity of DNA, view ancient artifacts, and hold real dinosaur and woolly mammoth bones. The last third discusses the creation model of origins. This section is omitted from public and charter school tours and has been since the facility opened. Science, by definition, is a systematically organized body of knowledge about a certain subject obtained by observations, experiments, and logic. Akron Fossils & Science Center adheres to this definition of science in all of its programming, exhibits, and research and exists to educate visitors to the Center of the censorship of real science in the media and academia around the world. Stating something about an event or process in the past that one did not observe, has no eyewitness account, and cannot replicate in an experiment is not empirical science, which relies on observation and experiment. This is actually forensic science which uses multiple lines of supporting evidence, eyewitness testimony, and logic to determine the truth of a past event and exclude all other possible explanations. We will apply these differing methods to Dyer’s examples in his article. Let us examine Dyer’s claim that “the Earth is 4.5 billion years old, and the only dinosaur to interact with humans is Barney.” Dyer appeals to the uniformitarian paradigm in suggesting that the earth is billions of years old. This goes hand-in-hand with the only other “scientific” claim he made in the article which is “that radiometric dating is a proven method of determining geological age by comparing the amount of radioactive isotopes present when a rock was formed to the amount that remains. This process works because radioactive elements decay at a constant and measurable rate.” Radiometric dating is in no way a proven method for determining age. 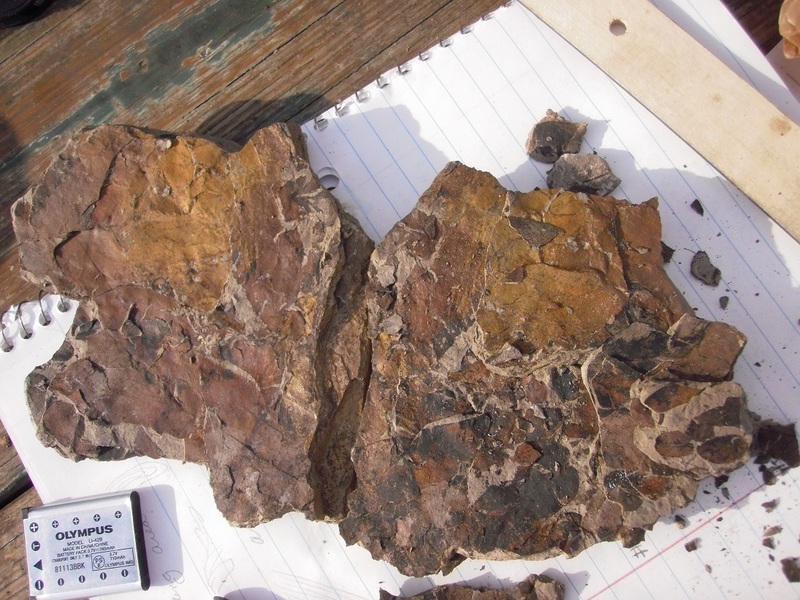 If it were, there would not be so many discrepancies in the ages that are found for a rock sample. An example comes from the Mount Saint Helens eruption in 1980. The lava hardened into rock and samples were taken twelve years after the eruption. The rock samples were dated at 340,000 – 2.8 million years. Obviously we can use observation to know that this date is wrong. The mathematical equation used for radiometric dating requires that we assume the starting amounts of the parent and daughter elements, that we assume the parent element decayed at a constant rate into the daughter element, and that we assume that there has been no contamination of the sample over time. These have been shown to be false assumptions because we know that water can leach radioactive elements, especially uranium, into and out of a rock sample and that volcanic rocks can form with amounts of both parent and daughter isotopes, not just the parent . Again, we can use observational science to falsify the claim that radiometric dating is a proven method of determining when a rock formed. Furthermore, carbon-14 dating, a type of radiometric dating has falsified the millions and billions of years mantra on its own. Diamond, which is the hardest naturally occurring substance known to man, has been found to contain carbon-14. Carbon-14 has a half-life of 5,730 years as calculated in the lab. If diamonds have been around since the formation of earth as many secular geologists claim then there should be no measurable carbon-14 left in diamonds. Diamonds are not susceptible to contamination due to their extreme hardness. How did the carbon-14 get there if it is not the original carbon? Additionally, carbon-14, not to mention blood cells and collagen, has been found in dinosaur fossils. Again, there should be no carbon-14 if these items really are as old as uniformitarians claim. Now let’s discuss dinosaurs. Dyer must not be aware that there are many artifacts around the world from ancient cultures that provide evidence that humans have interacted with, or at least have seen, dinosaurs before their fossils began to be described and dug up in the 1700s. (As an aside, the word “dinosaur” was invented in 1841 by Richard Owen, so these ancient cultures of course would not be using the same word to describe these animals.) One example of a dinosaur artifact is the brass engraving in Carlisle Cathedral on the tomb of Bishop Richard Bell who died in 1496. The brass engraving depicts creatures that have a distinct resemblance to sauropod dinosaurs. Another example is the Stegosaurus carving on the Temple of Ta Prohm in Cambodia which is 800 years old. Further archaeological evidence of human and dinosaur interaction can be found in South America in Peru on the Ica Burial Stones. These stones also depict advanced medical procedures that were “invented” within the last 150 years. Other examples include the petroglyphs of dinosaurs in ancient Native American art, dinosaur figurines in ancient Chinese art, and paintings and tapestries depicting dinosaurs in antiquated French and English art. How did these ancient people know of dinosaurs, what their skin looked like, their behavior and more if dinosaurs and people are separated by millions of years? Also, when one compares the descriptions of dragons in historical texts in a particular region of the world, and the fossils of dinosaurs from that same region, the descriptions match the fossils. Remember, too, the soft tissue and mummified skin of dinosaurs that should not be found if these items are indeed millions of years old. Did these ancient people use computer software to figure out how all the bones fit, what the skin color looked like, and the stance and behavior of these creatures in order to use them in art? Or is a better explanation of this data that humans saw living dinosaurs and used the term “dragon” to describe them? We cannot perform experiments to determine what these people saw, nor can we observe them. We can, however, use their written records, their art, and our logic to come to the truth by using forensic science. There are thousands of scientists and thousands upon thousands of books, articles, and other media that discredit the uniformitarianism ideas in science. Hundreds of PhD scientists have taken a stand against the evolutionary paradigm and the list can be seen at www.dissentfromdarwin.org. The scientific fields of study that we have were delineated and developed by people who expected order, design, and purpose in nature. That is from where “physics, chemistry, and every other scientific discipline” comes. Perhaps one should examine all of the evidence and explanations and use the best possible conclusion instead of censoring and attacking the opinions and reasoning of others. One of the fossil rocks we found on the dig. See our Facebook page for more photos. It was a chilly day in early April. The only flowers blooming were the skunk cabbages, and they normally bloom in February. It had been a cold winter and everything was behind. A brave band of science students, accompanied by supportive moms traveled down to southeastern Ohio to gather fossils on private property. A friend of the museum had invited us down for our first exploration. We were all very excited, but a little intimidated by the unknown. We were warmly greeted by our host and also got to meet one of his more unusual pets, a pot-bellied pig, as well as his two dogs. Then it was on to our destination. The previous days had rained heavily so the creek was running high and fast. The property owner waded in the water and drew up rocks filled with crinoids, but it was not safe for the rest of the crew so we climbed the cliffs instead. Well, not all of us climbed up the cliffs. The shale cliffs were in very fine layers with lots of clay and no roots to catch a foothold, so I was very impressed with the young people who could clamber up without any trouble. Everyone was in hard hats for this adventure! I gathered up rocks at the bottom of the cliffs and filled five-gallon buckets with treasures to take back to the lab. Everyone was glad when a bit of sun popped out later in the day and the younger folks took a break from rock hounding and played tag. The last task was loading up the van with buckets and gear. But had we found anything? Fossil hunting is a little bit like looking for hidden pictures. Sometimes the object you see is very obvious and sometimes it only becomes obvious after a bit of washing and scrubbing and letting the light hit your rock at a good angle. Because everyone was a lot more unsure than myself that we had captured any treasures, I started working on a few of our rocks at home. I have a few pictures to share what I have found so far in our samples from the cliffs. I can hardly wait for the students to come back to class this week so I can help them see what they have found!! Perhaps you will come by the Center and check out our treasures. The T-county patriot rally is a wonderful event for kids, families, and teachers. A multitude of museums set up tables and dress up in costume to bring history to life for visitors. Each year has a different theme – which in turn creates a fresh challenge each year as you can’t simply come as yourself and show off your museum. This year, each museum was to have a person dressed as an historical person from Tuscarawas County. At first, I cringed, after all, our museum is in Copley and we usually dress up as staff in green or blue t-shirts and sometimes someone gets to be a dinosaur… but that would not work for this event. Would it be possible to discover an historical creation geologist from Tuscarawas County? I knew of the Moravians and a little bit about the Zoarites, but not much else. After much searching, I discovered what I thought would be the perfect match, sort of. One of our museum tour guides, Christian, was chosen to play August Burkhardt, a Zoarite from 1898. He was not a geologist though, so there was still a lot of work to do to create a story that would work for this presentation. After all, August was a weaver. Becky and I dressed as friends of his who had come to visit him. Museum supporter Stevie P. offered to make us costumes. Becky set about making one of our props and I ran to gather fossils to bring. At the mall, everyone was bustling to get ready for the onslaught of over 500 children and their families who were expected to visit that day. I had previously given Christian and Becky lots of reading homework to help set the stage for our talk, and Becky had found additional articles to help us out, but each of us would need to be able to meld our presentation together “off the cuff”. The only rule I set for us was that every child who came to visit must learn at least ONE thing. They were not to be given a prize and stamp on their scavenger hunt card until that happened. This meant that each visitor would hear our story and see and touch what we had brought to share. I decided I was Miss Cindy, August Burkhardt’s friend from France, where I had read La création et ses Mystères Dévoilés, a work written by Antonio Snider Pellegrini in 1859, which described a world with one large land mass torn apart into separate continents by a great catastrophe, the flood of Noah. I was so excited to share this book with my friend August, who I know would appreciate Mr. Pellegrini’s thoughts, as August was a Christian Separatist and knew of the flood of Noah. I referenced a painting of the ark done by Quaker Edward Hicks in 1846 which we brought and set up on an easel. I then explained how the Quakers had loaned the Separatists the money they needed to buy the land for Zoar. I then told of the stories that August had shared with me; how his parents and/or grandparents helped dig the Ohio canal to earn money to pay back the Quakers. When digging a canal you can find all sorts of wonderful treasures. I then showed visitors samples of snail fossils, brachiopods, clams, flint and coal as well as other fossils I have found in Tuscarawas County. In showing flint and an arrowhead on loan to the museum from Kevin S., I shared how a gentleman from Newcomerstown in the late 1800s had found a paleo point similar in fashion to one found across the ocean in France! I also explained how coal was made of piles of plants that had the water squished out of them like the burnt rice I brought from my kitchen. Of course, all of these dead buried creatures were buried in the great flood of Noah! I then shared the strangest find of all…. Sometimes when digging basements or the canal, people would wind up breaking open a rock that contained a frog or toad in a stupor! These curiosities are called “torbid toads”. The toads would be in a small cavity in the rock that just fit their body. They had been there since the rock was first formed! When exposed to the air they often came back to life and have been reported to live for a few hours or even a few days. There are over 200 stories of entombed animals from places like New York and Europe. I shared a drawing made at the time of the toads emerging, and the maps showing where they were found – a picture of one that is still on display in the museum of London. After sharing this story as fast as possible, I asked each visitor one question about my talk and if they could answer, they received a stamp. Christian, alias August, did a wonderful job of really emphasizing how the flood of Noah was responsible for burying so many creatures all over the world and how the fossils from one continent matched those across the ocean. Miss Becky gave even deeper details on the torbid toads as she used her prop – a hand made cement rock with a hole just right for a toad. We talked continuously from 10 am until 4pm, all three of us at the same time to different people who came up to the table, though we would take turns slipping away to drink some water so we could still talk. I am so glad we had people listen to our stories. I am sure they will remember at least one small piece of what we had to say and hopefully they will begin to wonder about it all and put the pieces together. Several adults hesitantly asked us how “Noah’s ark could be reconciled with 2 million year old rocks”, or “when did dinosaurs fit in?” and we were happy to share all we knew. Miss Becky was especially adept at reciting facts about rocks tested with different dating methods and the failure of the geological column. I learned that others feel intimidated by all the arguing going on in our culture and they were very happy to find a safe place to share their trust in a Creator who did not start off by “making people out of monkeys.” There were many other great encounters that day. I look forward to seeing those who planned on coming up to the museum to visit us. Perhaps we will have to wear our costumes so they will recognize us! I also want to thank God for orchestrating a few things…. The Noah’s ark print first given to me about 6 years ago by Sean and Stephanie S. before they left for Honduras, Tirzah J. for giving the print to the museum so it was fresh in my mind and for loaning us a cap for Christian’s costume, the field trip by creation geologist Jim Whittaker to a Tuscarawas coal strip mine over ten years ago where I was able to gather coal samples from Tusc County, the gentleman from Massillon who gave us the huge lycopod root fossil when digging his septic, the Lyons family who gave us modern day lycopods from their property to press, the unnamed benefactors who passed along to us giant snail fossils to share (they were a perfect match for the Tusc county ones), Answers in Genesis for passing along a mysterious artifact along to us that has drill holes in it from early man, the great weather for loading and unloading, and all the friendly people from the Dennison Depot who helped us get set up. You can see some of the photos from this event on our Facebook page.